The Bank Transfer form is used to record the transfer of funds between an organization’s Bank Accounts. Restaurant365 does not initiate the transfer of funds with the bank itself. Transfers must be performed outside the system and then recorded in Restaurant365 using this form. Hover over the ‘Banking’ menu in the Top Ribbon and select ‘Transfer’. 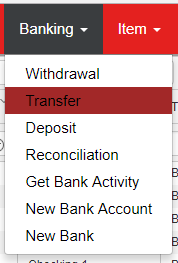 The Bank Transfer form will load in a new tab. When two Bank Accounts are selected that are owned by different Legal Entities, Restaurant365 automatically creates a corresponding ‘Intercompany Due To’ and ‘Intercompany Due From’ entry on the transaction. Once the Bank Transfer is Saved and Approved, the 'Distribution' tab will appear with the corresponding Intercompany Entries (if necessary). The Intercompany Bank Transfer leverages the pre-set account relationships between the Legal Entities.